Through it all, she slowly realizes that it is Will, not Mac, who she turns to for support and encouragement. Mac has the looks; Will has the heart. How can she choose between them? Check Me Out is a contemporary romance--with just a hint of Cyrano de Bergerac--that reminds us that it is what's on the inside that matters most. Anyway...I loved this story. All of the characters really came to life for me, and I had to force myself to put the book down each night so I could get to bed at a decent hour. I can't imagine living somewhere where the library is in danger of getting shut down. How can you live without a library? I could completely understand Greta's passion and fire when it came to her job. I love the author's witty, humorous style of writing. She had me laughing out loud more than once. I really enjoyed Greta and Will's relationship. I also got a kick out of Marigold. 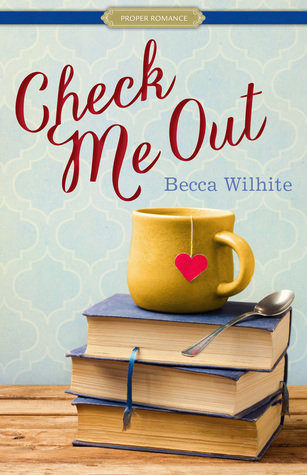 I really enjoy the books in the Proper Romance line, and I was excited when I heard about this contemporary addition by Becca Wilhite. What's not to love about a quirky book lover who is passionate about saving her library (and don't forget the inclusion of her perfect man). Check Me Out has a great cover (isn't it catchy? ), and an intriguing premise. I think it was well-written, although a bit long, and I loved Will. He's not your typical romantic lead, but he is a wonderful person. He's such a good friend-so giving and thoughtful. It was too bad Will was overshadowed by Greta's selfishness. It makes some sense seeing as this is Greta's story, but I struggled that she wasn't more likable. She was really shallow, and also a bit blind and clueless for the bulk of the story. She was a taker. She was helpful to the library patrons and her co-workers, and was passionate about keeping the library open, but her relationship with Will seemed very one sided. And that made me hurt for Will and dislike Greta. That said, Greta does have her eyes opened and becomes a better person by the end of the story. This is a story that stayed with me. I wanted to like it more than I did (and would have had Greta's transformation happened earlier so I could spend more time with the improved Greta), but it's one that I kept thinking about long after I finished reading. I suppose it caused some self reflection, and made me want to make sure I'm not like Greta, especially with those closest to me. I liked the supporting characters, enjoyed the Tweets, and was amused by the t-shirt pickup lines. This is a difficult review for me to write. As soon as I finished this book I texted my sisters and said, "I don't know how I felt about this book." It's still holding true days later. I wanted to love this book. I wanted to devour it and happily lend it out to all my book-reading friends. I wanted to tell them how great it was. But honestly, I can't. The premise of the book it great, and boy did it bring back some nostalgic feelings, and it made me think about my own library now. I live in a super small town and two of the towns near me have library built in old buildings. Part of me really feels for Greta when losing the old library comes up. These are awesome buildings, but they certainly aren't made for life today. So part of me is torn between saving the history, or making the library a more relevant place for the community. So anyway, that part of the book I loved. Greta's tweets about the library were entertaining and her passion for saving it was admirable. And then there is the rest of the story. Honestly, poor Will. I really wish he would have ended up with someone else at the end of the story. He gives and gives and gives, and is never on the receiving end. He cares so much and gets nothing in return. And you know, part of that bothers me too. When it all comes out, he doesn't even want to try for a relationship, he just wants to remain friends. That saddens me. I want him to have a happy ending, and I just don't feel like he gets one. I just don't think that the over-weight issue was handled well in this book. The premise was all set up for a great story, and the cover is delightful, but the shallowness of the main character just kind of made the story fall flat for me. I wasn't rooting for her, and I was rooting for him to find someone else, so I guess this was not a winner for me.